Its no Myth that Mythos is amazing! Home » Thoughts and Opinions » It’s No Myth That Mythos is Amazing! It’s No Myth That Mythos is Amazing! Just outside of the Wizarding World of Harry Potter’s Hogsmeade is a culinary delight awaiting – Mythos! Mythos, which is in Universal’s Islands of Adventure, is one of the best restaurants in Orlando – it has won many awards for having the best theme park food around. My family and I tried it on our recent visit to Universal Orlando, and were not disappointed! From the outside, Mythos doesn’t look like a restaurant. It’s exterior is rock formations, and a waterfall flows from the mouth of the face carved in the side. 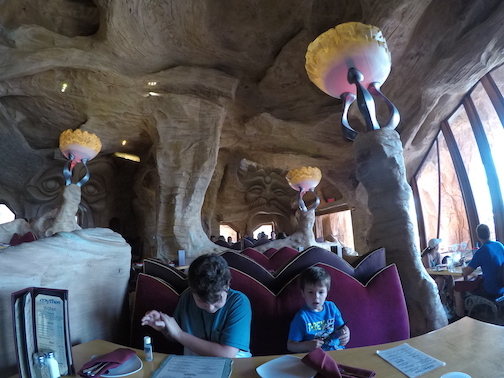 Once inside, the interior is also made up of rock formations, with various “caves” making up different parts of the dining room. It is nice while also being casual – which is excellent if you have little ones in your party. There’s a wide gap in age between our children, so I was concerned that Mythos menu wouldn’t appeal to them both. My oldest son is a very adventurous eater, while my youngest survives on peanut butter & jelly sandwiches. My worries were put to rest when our waitress assured us that the kids’ meals were standard fare. He settled on grilled cheese and fries, and was very pleased. I opted for the seasonal risotto, which during the summer had brussels sprouts and diced butternut squash. It also included the most tender hunks of beef I’ve ever eaten. 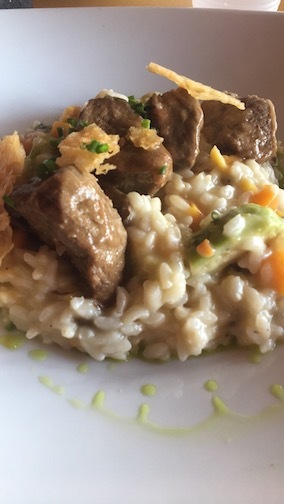 After exploring both parts of the Wizarding World, I’d worked up an appetite, and the combination of the tender beef, creamy risotto, and crisp veggies was amazing. 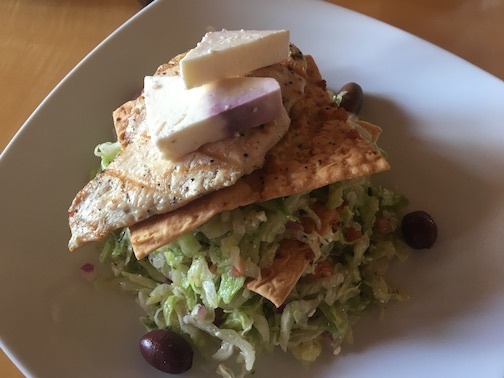 My husband went for Pad Thai with chicken, which he said was very good, and my oldest son opted for a Greek Salad with grilled chicken. Everything was fresh and tasty, and our server was one of the very best we’ve had anywhere. On the day we visited, the restaurant was busy, but not filled to capacity. We had advanced reservations (which may be made using the Zomato app or online), so our wait was small when we arrived. I highly recommend building time into your Universal trip to enjoy this restaurant, which is truly an experience itself! If you’d like more information on traveling with tweens and preschoolers to Universal Orlando, please contact me at allisonf@wishesfamilytravel.com or visit me on Facebook.com/aflynn.wft.